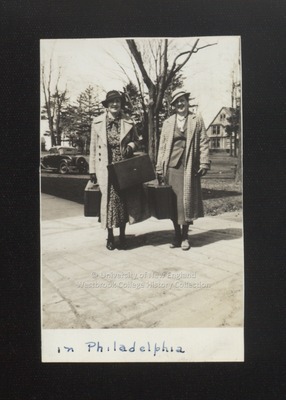 Two Westbrook Junior College students stand on a broad sidewalk, suitcases in hand, in this 1936 sepia toned candid snapshot labeled on the front in blue ink "in Philadelphia." On the back is written in blue ink: "Moore & Cole spring vacation." Moore and Cole wear the same coats and felt hats and gloves as they did in the previous photo labeled "All set for vacation." They smile, looking directly at the camera. Gift of Frances Savage Taylor, graduate of Westbrook Junior College and Farmington State Teachers College.